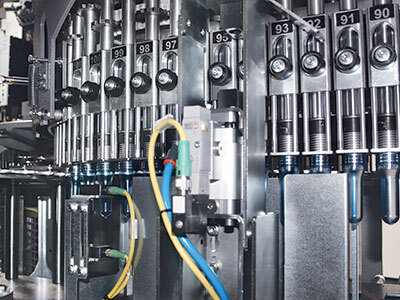 The integrated system of stretch-blow moulding, filling and capping featured by SMI ECOBLOC® ERGON VMAG/EV and VMAS series combines the functions of a rotary stretch-blow moulder, of an electronic rotary filler and of a rotary capper. The preforms are transferred from the hopper to the unscrambler through a lifting belt; the unscrambler conveys them to an inclined guide, from where they reach the spacer star wheel at the heating module infeed, by gravitational fall. The star wheel feeds the rotary mandrel chain, through which the preforms are “captured” and let into the heating module. Before entering the heating module, equipped with infrared lamps, each preform undergoes accurate checks, which detect its size and vertical position and automatically eliminate the preforms not compliant with the pre-set parameters. The preforms, supported by the mandrels, start moving along the heating module. During the heating process, the preforms constantly turn around themselves, so as to ensure an excellent and symmetrical heat distribution. 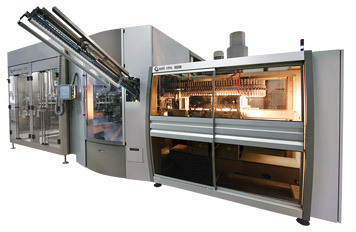 The heating module is equipped with two different cooling systems: a liquid-fed cooling system, in order to cool the protection ring preventing the preforms thread deformation during the heating process; an air-fed cooling system, in order to keep the temperature inside the heating module as low as to avoid the exposure of the preforms outside walls to too high temperatures. At the heating module outlet, a sensor detects the preform temperature and compares it with the temperature set point; if the two values do not correspond, it increases or decreases the heating module lamps power. - final blowing with high-pressure compressed air, through which the containers take their final shape. A counter-pressure air system ensures the perfect locking of the moulds, whereas the mechanical locking of the mold-holders allows bearing the strengths generated by the stretch-blow moulding process with the maximum reliability. Also the stretch-blowing stations are equipped with a liquid-fed cooling system, which keeps the molds temperature constant. During the blowing process, an accurate measurement system checks that the process follows the pression profile required. In fact, a pressure drop would alter the container shape which would cause the automatic rejection of the container. 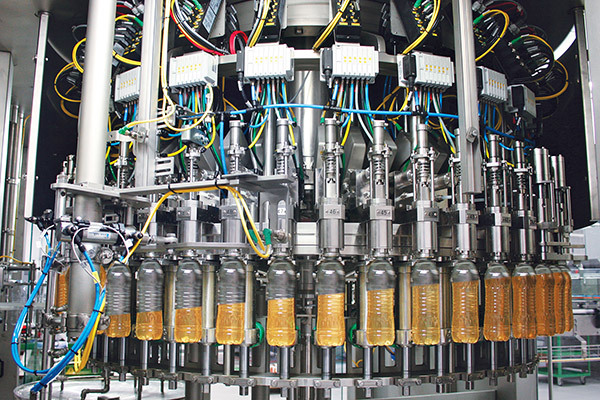 The finished bottles are picked from the stretch-blowing stations by another rotary group of grippers and put onto an air conveyor which finally transfers them to the filling machines. 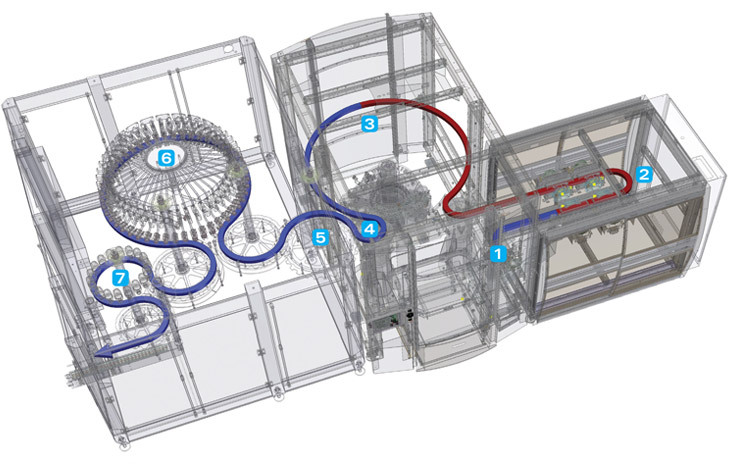 After being manufactured by the stretch-blow moulding machine of the EBS ERGON series, empty bottles are conveyed from the blower to the filler by "neck-handling" direct transfer through a starwheel-starwheel system. The star-wheel at the blowmoulder outlet is equipped with grippers electronically synchronised with the brackets of the starwheel at the filler inlet. 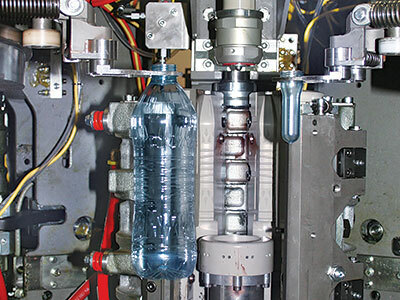 A sensor detects the presence of the bottle at the filler inlet; the filling process starts only if a bottle is detected. 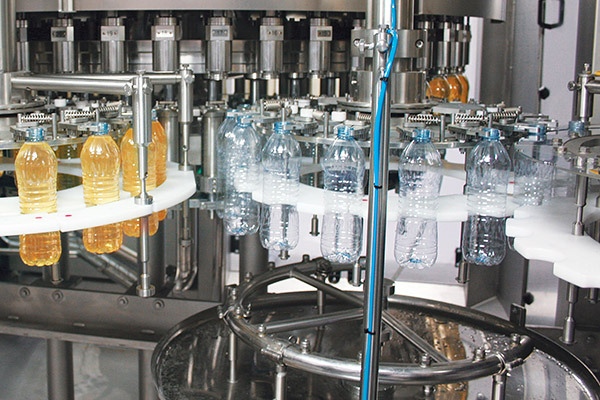 The product to be bottled is fed from a small external tank to the filling valves by means of a pump or by gravity in the case of foam products. 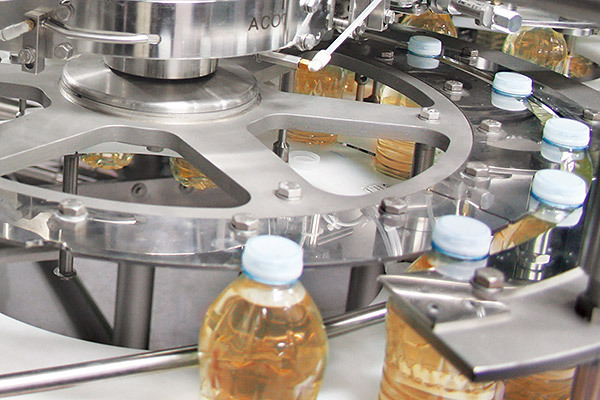 The filling process is electronic volumetric with magnetic flow-meters (VMAG models for conductive products) or electronic massic with mass meters based on the Coriolis' principle (VMAS models for nonconductive products). A flowmeter positioned upstream of each filling valve gauges the amount of product flowing through. The flow amount is gauged by pulses-counting: upon reaching the set amount of pulses for the current format, a signal is sent to the filling valve to be closed. 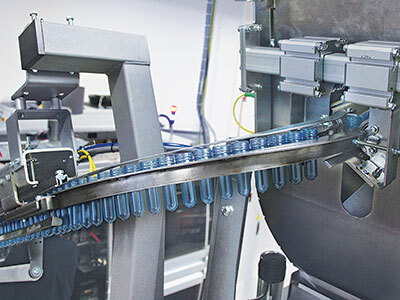 Full bottles are transferred to the capper by means of a star-wheel equipped with grippers. 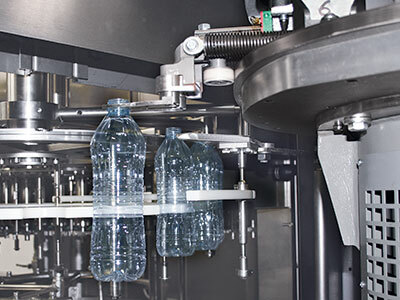 Caps are oriented in the correct position by a hopper-unscrambler standing outside the machine at an easy-access height, and are transferred to a pick & place device positioning the cap under the capping head, which moves downwards and applies the cap on the bottle. easy and quick format changeover, with no need to replace mechanical components. the flowmeter gauges the quantity of product (volume or mass) flowing through the pipe feeding the filling valve and turns it into pulses. upon reaching a given number of pulses, the filling process stops. no more air thrust (optional).